Tired of reading from your LCD? We’ve listed some of the best upcoming tech events, so you can kick back and listen to your favorite speakers in the wild! For each event we’ve arranged a special discount. Make sure you visit TNW Events whenever you’re looking for one or before you’re about to book one. Would you like to have your conference or event listed here? Contact Sophie. We’re also always happy to meet with TNW readers at events we’re attending. Want to know where to meet TNW editors? Follow TNW on Plancast. So let’s check out the updated list! Dublin Web Summit is fast becoming one of Europe’s biggest tech events. The two day event has three streams (Cloud, Social Media / Marketing and Startups), over 60 speakers including Werner Vogels of Amazon, Eric Ly, LinkedIn co-founder and Mikael Hed of Angry Birds fame with many more to be announced. The European Pirate Summit. True technological innovation, creativity, risk disposition and delight of entrepreneurship instead of MBA-bearing and copycats. Everyone who can identify himself with these prerequisites should apply for the Pirate Summit, an exclusive networking-event in the European start-up community. Content of the workshops/panels/keynotes are: Coding, design, usability, business development, product, funding und ad-hoc topics. TNW readers will get a discount when you choose TNW as a referral here. Newly expanded strategic conference sections covering Multi-Platform TV, Content Delivery Networks, Connected Home, Internet TV, Content Business Strategies and Video On Demand. Meet the newest and best of Israel’s mobile & media industry and take part at the largest meeting place for Operators, Solution Providers, Multi-Screens app developers, System Integrators, Content & Media Providers, Media & Social Evangelists and more. TNW readers will get a special discount (Only 300 NIS instead of 350 NIS) by using code “TheNextWeb” here. More than 500 attendees from all over the world will get together in Finland to witness the hottest Nordic and Baltic startups of 2011 launch their businesses and services. Not only will there be interesting new companies to meet, Arctic15 will witness some of the most inspirational speakers from the region and beyond. Produced by 500 Startups, The SMASHSummit is 1-day conference about the future of online marketing. SMASH teaches strategies, tactics, & tools used by successful online companies to acquire and retain customers on platforms such as search, social, rich media, video, mobile and email. In contrast to many ‘marketing’ conferences, SMASH is predominantly led by (wildly) successful startup founders and tech geeks who are constantly rewriting the new rules of marketing. Speakers include founders and executives from companies such as Facebook, YouTube, Foursquare, 500 Startups (Dave McClure, Rackspace (Roberts Scoble), Gilt Groupe, Turntable.fm, GroupMe, Medialets, DailyWorth, First Round Capital, and many others. TNW readers will 15% off their tickets here if they use the discount code: TheNextWeb. The first officialViadeo Hackday will take place from 6.30 pm on Friday 30th September until 7.30pm on Saturday October 1st. This completely free event is a great opportunity for start-ups, developers and designers to spend just under 24 hours creating innovative API integrations with exclusive mentoring from Viadeo and our partners. You should come if you love APIs, want to meet other devs and designers and enjoy free pizza and beer! Participants will also get the opportunity to win great prizes including an all-expenses paid trip to Le Web. API Developer Day is a one-day event to celebrate APIs and the amazing things we can build with them. Find a team or go solo, meet new local developers and API teams, get coding support, collect swag, build the best thing you can in one day and demo it to the group. STARTUP WEEK is a five-day startup festival with focus on Startups from Central and Eastern Europe. On stage: Europe’s 50 most innovative startups present their business idea. Backstage a top investor panel picks the top ten. Festival-feeling with 12 focus events and 70 international star-speakers. TNW readers get a 20% discount on the tickets by using the code tnw14r here! The Future of Web Apps London (FOWA) is a 3 day conference aimed at Web Developers and Entrepreneurs. FOWA brings together web visionaries to discuss the technologies, platforms and business models you should be using to launch the next generation of successful web apps. The conference kicks off with our full day workshops followed by 2 days of a 2 track program. TNW readers will get 15% discount on 2-day Conference passes only, using the promo code TNW here. Chinwag Insight: Facebook Marketing. This conference will empower senior marketers with insight on how to harness Facebook to create a positive impact on their business. Hear from Facebook&brands including BBC, Dell, Channel 4, Visit Britain with case studies covering Dell’s Trade Secrets campaign, BBC (Dr Who & Top Gear), Expedia, Channel 4’s The Big Fish Fight, Tesco’s Mr Men Sweets and Chelsea Football Club, with more being confirmed. Plus, expert advice and the wisdom of experience from leading agencies 1000heads, W+K London, Starcom MediaVest, Buddy Media, We Are Social, Efficient Frontier and Antony Mayfield. 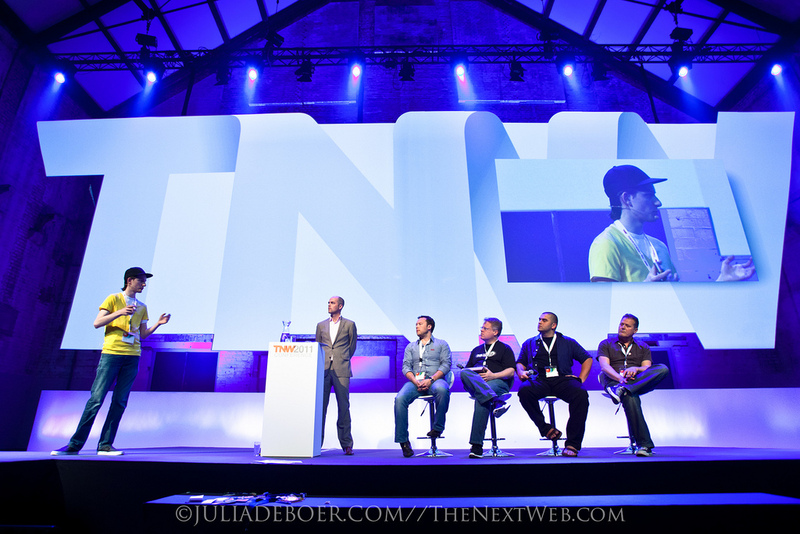 TNW readers get a saving of £120 on the ticket price with code: The_Next_Web here. Europe’s premier event for online marketing and social media in travel professionals. Recently re-located from Prague, the 2011 event sees an abundance of best practices, hints and unrivalled networking to drive forward your social media and marketing strategies! Hot topics this year include mobile, flash sales, ROI tracking and much more. Speakers include Design Hotels, Deutsche Bahn, KLM, IHG, Melia Hotels, Google, LivingSocial and many more. TNW readers are entitled to a €100 discount, use TNW100 here. Webprendedor 2011 is an event to push the digital entrepreneurial culture in Chile. Is one of the biggest event for wannabe entrepreneurs in LatAm and this year want to build a real bridge between Silicon Valley and LatAm. This year there are 2,300 pre-registered attendees and the event will run for a week during October 10t-15th. The Mobile AR event of CTIA Enterprise and Applications. This full day (11-6) event will cover the opportunities for developers, brands, agencies and the enterprise. As a TNW reader get a nice discount by contacting them at info@mobilearevent.com for special registration code. BeingDigital provides a unique opportunity to share ideas, insight & inspiration and connect & collaborate. Helping your organisation to understanding the emerging digital trends, giving you the practical insights to in how to integrate them into your organisation. BeingDigital brings four big themes for business over a two day summit giving your organisation the flexibility to participate and attend one or all four themes. TNW readers will get 20% discount when using promocode “tnwdigital” here. EM20 – Enterprise Marketing 2.0. Cutting edge Online and Social Media Marketing – what’s next? 20+ industry leading social media experts from large (B2B and B2C) companies including Nike, BMW, Carlsberg, Ericsson, Jamie Oliver, Philips & Unilever. 8+hours of networking opportunities. Eat, drink and party on a boat in Amsterdam for free! You can follow #em20 for updates. TNW readers get €100 off tickets. Click here to view the full programme and registration form. Developers, programmers and designers from all over Europe are invited to come to the design hotel EAST Hamburg for a two day Developer Convention on 13./14. of October 2011 to hack awesome applications and services on top of the worlds leading and most popular cloud computing infrastructures. During the whole event mentors from the worlds leading cloud infrastructure providers support them to implement their ideas. The two day event will comprise an unparalleled programme of speakers, renowned in their fields and at the forefront of change. Experience the latest innovations and take a unique journey of discovery and inspiration. WIRED 2011 Together with 02 will provide a unique platform from which to engage with the future and bring WIRED to life in an environment of like-minded thought leaders and innovators. Your chance to meet the WIRED100 and hear from over 25 leading speakers. TNW readers will get 10% discount. Use code: WTNW10 here. Pivot is the only conference focused purely on how major brands, agencies, marketers and content creators can succeed by understanding, accessing and influencing the emerging Social Consumer. Hosted by Brian Solis, author of Engage, Pivot delivers two full days of unique content and experiences that illuminate the altered marketing landscape, delivered by transformational thinkers, technologists, entrepreneurs and entertainers. Register here with promo code TNW20 and save 20%! DevReach strives to be the premier developer conference on Microsoft technologies in Central and Eastern Europe. For the 6th consective year the 2-day conference gathers a great team of speakers – Scott Hanselman (@shanselman), Jesse Liberty (@JesseLiberty) and Tim Huckaby to name a few. DevReach offers an ideal opportunity to enhance your proficiency by sharing the knowledge of acclaimed experts who are Microsoft MVPs, Microsoft Regional Directors and INETA Speakers and Leaders and by networking with more than 500 fellow developers from all over CEE and beyond. TNW readers will get a special discount of 25% off the conference pass here. And on check out please use Code 74329d01 for credit card payments. For paying via bank transfer, please email us at info@devreach.com. Once each year,the Web 2.0 Summit brings together over 1,000 senior executives from the worlds of technology, media, finance, telecommunications, entertainment, and the Internet to discuss the most important topics of the day. For 2011, our theme is “The Data Frame” — focusing on the impact of data in today’s networked economy. Join us October 17-19, 2011 at The Palace in San Francisco. TNW readers can save 15% at registration with code NEXTWEB here. The 1st annual Contact Summit will bring together technologists, net activists, social entrepreneurs, and change agents, to realize the potential of peer-to-peer networks. We seek to expand the web as a tool for free expression, collaboration and value creation, and celebrate initiatives which advance that mission. From business models for distributed work teams, to open-source tools for organizing communities, to building wireless mesh networks and internet infrastructures free from political and commercial interference, our discussions will cover opportunities and challenges of a globally networked society. TNW readers will get 20% off the price with code NEXTWEB117 here. Chain reactions occur constantly around us, be it deliberately or independently triggered. A small change can cause a linear sequence of successive events, impacting our lives in a profound way. This year’s TEDxVienna will bring together speakers and performers able to analyze the resources, technologies and skills necessary to channel the energy and outcome of such successions. TNW readers get discounted tickets when you mention “TNW reader” here. At Street Fight’s kick-off conference, hyperlocal industry leaders will debate the strategies that will define a lasting, sustainable new landscape for local online marketing (including content plays, daily deals, and location-based services). Confirmed guests include top execs from Foursquare, Patch, Yipit, Gilt City, Topix, Fwix, DNAInfo, Main St. Connect, Datasphere, Zaarly and Journal Register. TNW readers will get special price tickets here. App Developers Conference. Addresses key components of app development, discovery and revenue. Join major brands, media, social networking, mobile, consumer electronic, and software platforms and, of course, the worldwide developer community. Speakers include: Walmart, Pandora, Smule, Samsung, AT&T, Churn Labs, Nissan, Nielson, BMW, Pulse, Microsoft, OpenFeint, Qualcomm, lolapps and dozens of others. Coverage includes mobile devices, tablets, televisions, autos and internet connected consumer electronics devices. Use discount code TNWVIP to save 10% here. JAX is the most comprehensive Java Ecosystems conference covering web and enterprise development. It is the ideal forum for software developers, project managers and architects to learn about the latest Technology, Architecture and Agile Methodologies. TNW readers can get a 15% discount on all passes by enter discount code JAX11TNW when registering here. They’re also offering a free Intellibook to anyone who registers for the full 3 days of the conference. Now in its 2nd year, the SMWF North America event this year will be providing a format for networking, engagement, and lots of social media debate around the latest tools, technologies, platforms, and emerging trends within social media marketing. The show has grown significantly to become one of the leading shows in its field, hosting a variety of free to attend workshops & conferences for marketers, PR professionals, brands, agencies and SME’s. There is a 15% discount to The Next Web readers by entering the discount code NEXTWEB15 when registering here. Apps World N.America brings together many of the region’s top app Developers, Network Operators, OS Vendors, Brand & Marketing Managers and Technology Providers; looking to connect, build partnerships and network whilst becoming educated and inspired by the latest developments within this exciting industry. The event of choice for the region’s App Developers, Network Operators, OS Vendors, Brand & Marketing Managers and Technology Providers; looking to connect, build partnerships and network whilst becoming educated and inspired by the latest developments within this exciting industry. The Next Web readers can get 15% discount on admission prices by entering NEXTWEB15 when registering for the event at here. As a TNW reader register here with the promo code TNW20 to save 20% off any conference pass, or use code TNW50 to save 50% off Expo Passes (which include access to the Exhibit hall as well as all keynotes and parties, just like the conference passes). The 2nd Android DevCon, the technical conference for software developers building or selling Android apps, arrives after a smashing debut in March, 2011 (nearly 1,000 attendees and 20 major sponsors). It will offer one day of intensive workshops, followed by three days of technical classes. More than 1,000 software developers, engineers and entrepreneurs from 35 nations are projected to attend Android DevCon and choose from 70 classes to bring Android open source development to a high level. TNW readers receive a $100 discount off the Full Event Passport and/or gain free admission to the exhibits (first time registrants only – cannot be combined with other offers) by inserting the code MEDIASPONSOR here. J. Boye Aarhus 11 is an International conference for web and intranet professionals. Programme reflects what is moving and shaking digitally in large organisations today. The programme features cases from a cross-section of industries. Tangible solutions you can take away and implement now. Introductions to some of the things that are coming and how to best prepare for them. An event that helps you solve your headaches and optimise your opportunities. An event that puts you in touch with other digital decision makers with similar agendas. TNW readers get 10% discount by quoting “TheNextWeb” here. Under the Radar is a catalyst for doing deals. Meet with 350 decision-makers from global carriers, brands, technology companies, startups, and investors responsible for helping companies leverage new mobile technology in the fast-evolving digital landscape. How to Web 2011 is one of the most important Eastern-European web-focused events, providing to local web entrepreneurs, business professionals and developers the inspiration, knowledge and connections they need for improving their web businesses and products. This year’s edition of How to Web will include 20+ presentations and panels, 10+ workshops, the Startup Challenge competition, an expo area, private parties and excelent networking opportunities. The Digital Brand Strategy Summit brings together senior client marketers every year to debate and discuss the impact of digital on brand management. This year the summit will focus on social business – the hot topic amongst thought leaders around the globe. In this years’ summit, we will be showcasing innovative social business thinking and looking at successful case studies from leading brands. The future of social means more than simply having a brand page on Facebook. TNW readers get a 15% discount register using discount code TNW15 here.